A couple of weeks ago, Sarah and Evan cooked at the James Beard House operated by the James Beard Foundation in New York City. We had the pleasure of watching them via a webcam in the kitchen. Their dinner menu included a number of the dishes that have become favorites at Rich Table in San Francisco, including gazpacho with strawberries, chicken skin, and burrata. I have enjoyed that dish several times, but I am not a skilled enough cook to duplicate it, so I’ll just need to make do with gazpacho. 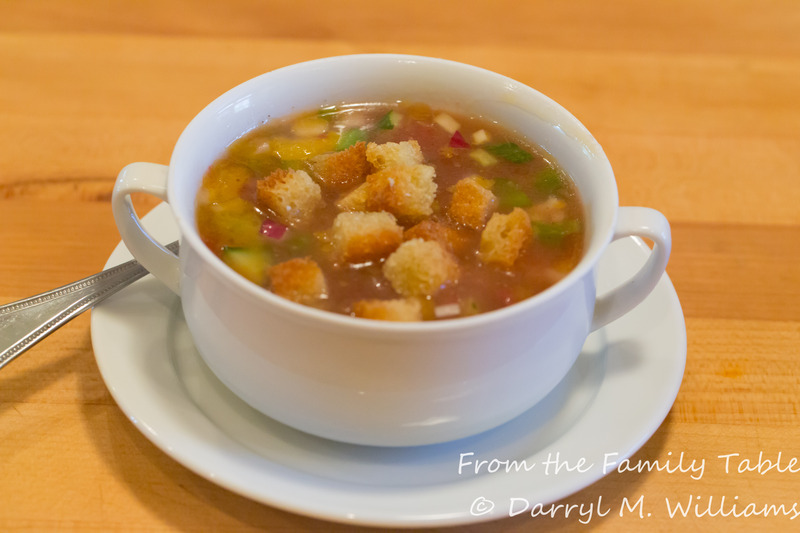 For me, the taste of traditional gazpacho is wonderful. But I don’t like the mouth-feel. It reminds me of baby food. I much prefer seeing the vegetables and bread intact so that it’s almost like eating a liquid salad in a bowl or cup. 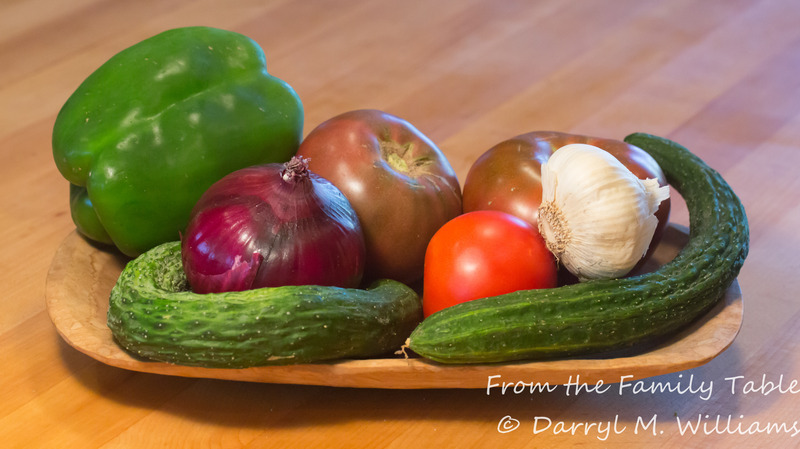 I found just the right ingredients at the farmers market, including an Armenian cucumber, aka snake melon. It is not really a cucumber, but it has the crispness and crunch of the freshest of regular cucumbers and without having to worry about seeds. It also has the charm of being slender, long, and coiling around itself. It’s easy to see why it has the name of snake melon. Easy to make, and refreshing in the fading days of summer. In a large bowl, whisk together the lemon juice and olive oil. Stir in the tomatoes, bell pepper, onion, cucumber, garlic paste, and parsley, making sure to coat the vegetables with the lemon/olive oil mixture. Stir in chicken stock. Adjust seasoning with salt and pepper. Chill in the refrigerator for 2 hours. In the meantime, let the bread cubes dry at room temperature for 1 hour. In a small skillet, heat the remaining olive oil over medium heat. Add the sliced garlic and sauté for a few minutes until the garlic is lightly browned. Remove the garlic slices, and add the bread cubes, stirring frequently until lightly browned and crisp. Drain the croutons on several layers of paper towel. Cool, and set aside until ready to garnish the gazpacho. Serve the gazpacho in bowls or in large cups with a spoon. Garnish with croutons. The best green chile cheeseburger I have ever eaten was at Ski Apache near Ruidoso, New Mexico. I realize that there is a situational bias to that statement. Every day during ski season, weather permitting, cooks fired up an outdoor grill close to the lift line. The scents of fresh roasted green chiles and hamburger would drift up the lift line creating hunger pangs that made it hard to unload at the top. Then you had to deal with the wonderful fragrance as you made it down the trail as quickly as possible to get in line for your own burger. 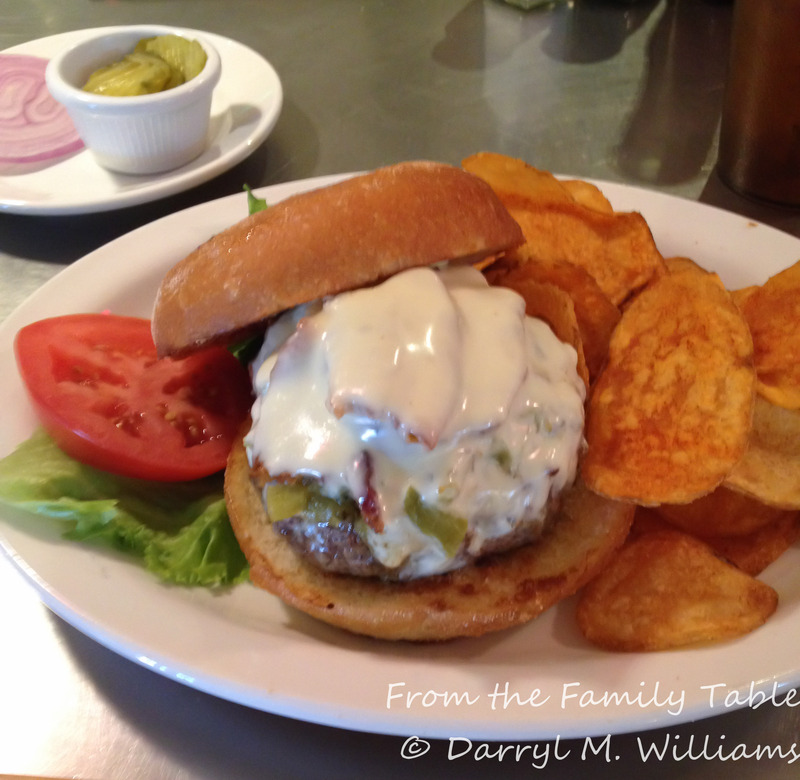 Since then, I have been looking for the perfect green chile cheeseburger. I am not alone in that quest, nor am I the first. In fact, the State of New Mexico has its official Green Chile Cheeseburger Trail. New Mexico has an official state cookie – the biscochito – and two official state vegetables – the chile and the pinto bean – but it does not have an official state dish, probably because there are a lot of candidates – enchiladas, Frito pie, fry bread among them. Nor does the state have an official sandwich even though nearly every New Mexican would probably agree that the designation should go to the green chile cheeseburger. Nobody knows exactly who invented the GCCB. Some say it was the original Blake’s Lotaburger store in Albuquerque. (Blake’s is our local junior McDonald’s or In-N-Out with stores all over the state.) Of course that claim is disputed, and there are several claimants to the honor. Whatever the origins, the GCCB can be found in virtually every city and hamlet across the state, most of them claiming that they have the world’s best GCCB. The first GCCB to gain national recognition came from the Owl Café in San Antonio, NM, a tiny little town just off Interstate 25. It was made famous by the commentator, Charles Kuralt who discovered it in his journeys around the USA. For years I always stopped at the Owl on my many trips up and down the interstate. Then I discovered Manny’s Buckhorn Tavern, just a short distance across the road in San Antonio. The rustic outsides, the numerous flashing beer signs and the armada of parked motorcycles suggested that it was not the place to be, but once inside, it felt comfortable and welcoming. Bobby Olguin, Manny’s son and heir was at the flat top behind a partition, frying up Buckhorn Burgers. The solitary middle-aged waitress was scurrying around taking orders, and the stuffed mountain lion and various birds of prey occupied the walls of the back room. Bobby always stuck his head around the partition to give a welcome, and if things were slow, he would pay a little social visit at your booth. Then things changed. the Buckhorn was discovered by the Food Network and Bobby Flay, who lost a throw-down to Bobby Olguin. After that, there was a long waiting line at the front door and a sign that said, “Please wait to be seated” near the entrance. Bobby hired some cooks to work the flat top so that he could work the dining room, and sadly, the stuffed mountain lion disappeared because Bobby had watched Robert Irvine’s television series about restaurant re-dos. Bobby thought the place needed a face lift and the mountain lion had become too dusty and mangy. Nothing much else has changed, and the GCCBs are as good as they have ever been. San Antonio, besides being the epicenter of the world of the GCCB is also the gateway to the Bosque del Apache National Bird and Wildlife Refuge. During the winter, birders from all over the world come to watch the hundreds of thousands of sand hill cranes, Canada geese, and snow geese along with bald eagles and numerous other birds. Of course, many of those tourists visit the Owl and the Buckhorn. One of our previous governors, unwilling to get caught up in the controversy of who had the best GCCB in New Mexico, but wanting to promote the competition and with the encouragement of food writers, suggested the promotion of the GCCB. The Office of Tourism took up the effort in 2009. They created the Green Chile Cheeseburger Trail, identifying restaurants across the state with noteworthy GCCBs. The list was updated in 2011 with the help of noted Santa Fe cookbook author, Cheryl Alters Jamison, along with other food writers and cooking professionals. Their list included around 200 noteworthy GCCBs. Both the Owl and the Buckhorn recused themselves from any competitions to select the state’s best GCCB. Still, there were lots of potential candidates. Sparky’s is a perennial favorite. In part that is because the place is in Hatch, home of the world-famous New Mexico green chile. Bert’s Burger Bowl in Santa Fe is often mentioned as a contender because it has been featured on Guy Fieri’s “Diners, Drive-Ins and Dives” on the Food Network. Unfortunately, some of the strongest contenders have shuttered their doors. 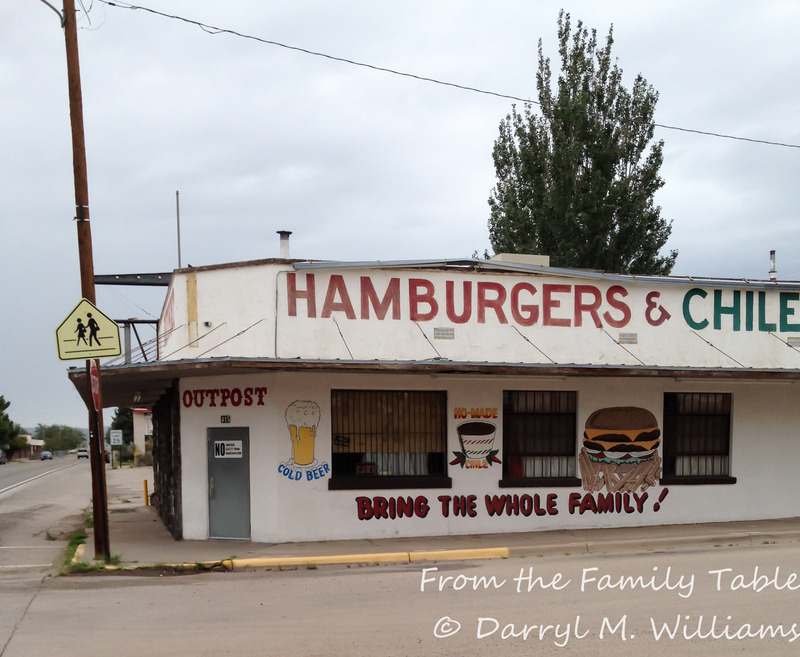 One of my favorites was the Outpost in the town of Carrizozo, just down the road from San Antonio. It was a family biker bar with motorcycles lined up in front, 12-foot rattlesnake skins tacked up on the walls, a terrarium filled with lizards and other desert varmints, and a pool table toward the back of the dining room. They had a wonderful GCCB along with crisp but greasy French fries, but I guess the owner just got tired and decided to close. In my view, the Santa Fe Bite stands in a class of its own. It formerly operated as the Bobcat Bite in a tiny little adobe building just off the interstate several miles from Santa Fe. It had quirky hours, and there was always a line waiting for coveted few seats when it was open. After a lease fight with the adobe’s owner, the restaurant relocated to much better, bigger digs in downtown Santa Fe. They are still jammed at lunch time. Their burger is made of 10 ounces of freshly ground sirloin, prepared to your liking. Because it is so big, even for medium rare it takes a while to prepare. Just be patient. You can get it plain, with cheese, with green chile, with bacon, or with all of the above along with fresh house-made potato chips and a side of onion and pickle. Of course, there’s mustard, ketchup, and mayonnaise available, but to me that just covers up the great taste. The Santa Fe Bite GCCB is definitely not for the faint-hearted, and you should be prepared to ask for a doggy bag. If you’re interested in following the GCCB Trail, check out the website. You won’t be disappointed wherever your travel takes you. Some time ago I wrote about James Kraft and his invention of Velveeta processed cheese food. His small company morphed into a giant food manufacturer that has been responsible for some of the inventions that have made American cuisine what it is. Those inventions include Miracle Whip salad dressing, Cheez Whiz, Parkay margarine, and arguably the most famous of all, the Kraft Macaroni and Cheese Dinner that came into being in 1937. Since then, there is probably not a single American child who has not had boxed macaroni and cheese. In fact, in our family it is a child’s favorite that is often preferred to Mom’s carefully crafted (no pun intended) macaroni and cheese made from the finest ingredients. The good news is that children’s tastes change as they grow older. Recognizing the appeal of boxed macaroni and cheese dinners with kids, some time back when we were watching over some of our grandchildren for several days, I bought a box but wound up not using it. It came home with us and has been residing in our pantry for awhile (It is virtually indestructible and will probably last forever, along with my box of Velveeta). It has become a bit of an embarrassment, so when I was reorganizing the pantry a while back, I decided to use it with the sub-plot of disguising it so much that it would fool an adult. Well, it turned out to be pretty well disguised, but sorry to say, you will not be fooled. Still it was a pleasant diversion and something that went ok with soy-sauce-and-lemon-vinaigrette-braised flounder. Prepare the macaroni and cheese dinner according to instructions on the box. Pour the finished dinner into a bowl and set aside. With your hands, squeeze as much water out of the thawed spinach as you can. Chop finely. Saute the mushrooms over medium heat in the olive oil. Drain. Top with panko and grated Parmesan. Dot with butter. Bake in the middle of a 350° F (177° C) oven for 40 minutes or until the top is browned and bubbling. Serve. This past week I discovered a new vendor at the farmers market, a young man with a big basket of fava beans. I bought what I thought was a huge bag, forgetting that fava beans are one of those joys of fresh vegetables that is associated with a lot of effort and a very small return except in flavor. I shelled what looked like a quarter bushel of favas, blanched the beans, took off the rubbery outer layer, and wound up with a cup of bright green beans. It’s no wonder that many cooks consider them either the equivalent of gold or not worth the effort. Fava beans are one of the few (only?) Old World beans, and they have been grown for centuries in the Mediterranean basin. It seems a quirk of geography and genetics, then, that some individuals of Mediterranean extraction, most commonly, may harbor a deficiency of an enzyme, glucose-6-phosphate-dehydrogenase (G6PD for short) that makes them susceptible to substances found in fava beans. If an individual is sensitive, he – more common than she – may experience a sudden illness with rapid breakdown of red blood cells, and even kidney failure and death unless it is recognized and rapidly treated. The illness is well-known and has been called favism to show the link with fava beans. Fortunately, the vast majority of individuals can eat fava beans without worry. I had thought that favas and prosciutto would go well with lightly sautéed bucatini pasta, but alas there was none to be found in any of the local stores. At that point I turned to my copy of Encyclopedia of Pasta, written in Italian by Oretta Zanini de Vita and translated by Maureen B. Fant (University of California Press, Berkeley, 2009). If you haven’t seen that little volume, you should check it out. It describes nearly every pasta shape you can imagine, tells how each pasta is made, and suggests how to use each one. With all of the sensory overload of that beautiful book, I remained undecided until I remembered some wonderful pasta that I had purchased at our village market. I found it in the pantry, four-foot lengths of pappardelle folded in half and dried for “easy storage”. The manufacturer, Maestri Pastai, makes all kinds of unusual types and sizes of pasta. That’s great if you have a hard time finding exactly what you are looking for and don’t have the time or skill to make it yourself. Check out their website. The rest of the ingredients for this dish were easy to find. I had a spare package of prosciutto in the refrigerator, and that seemed like the perfect foil for the favas. The scallions came from the market, the mint from the back yard, and there is always a chunk of Parmesan in the refrigerator. Plunge the shelled beans into two quarts of vigorously boiling salted water. Return to the boil for one minute – no more – and then drain the beans and transfer to a large bowl filled with ice water. When the beans have cooled, remove the outer skin with your fingers, being careful not to mash the beans. Collect the bright green inner beans in a small bowl and set aside. In a large pot, bring three quarts of salted water to the boil. Add the dried pappardelle and stir occasionally until the pasta is cooked, al dente, about 12 minutes, longer if you live at high altitude. Drain the pasta but do not rinse.Return to the pot along with the butter and olive oil. over medium heat. Add the scallions. Stir occasionally until the butter is completely melted and slightly colored. The pasta should have absorbed the oil and butter and sautéed lightly, but not browned. Stir in the fava beans and prosciutto until they are warmed through – 2 or 3 minutes. Stir in the mint leaves. Adjust the seasoning with salt and pepper. Top with grated Parmesan, and serve immediately. It’s the time of year again when squash blossoms make their appearance at the local farmers market. When that happens, I always buy a dozen for stuffing. Of course, if you have your own zucchini patch, you can harvest your own squash blossoms. Choose the male flowers without the swelling at the bottom that will ultimately become the mature squash. It is surprising how many things you can do with these delicate flowers. There is a lovely soup, sopa de flor de calabazas, and you can use them in quesadillas, pancakes, etc., etc., but I always wind up stuffing them. Whatever you do with them, use them the day you buy or pick them because they fade very quickly. If the blossoms have stems, you can keep them fresh in ice water in the refrigerator with a plastic bag over them, just as you keep parsley and other herbs. Even then, you should try to use them the same day you buy or pick them. Exactly three years ago, I posted a recipe for stuffed squash blossoms which I liked a lot (still do), but the batter was a little heavy. The mushrooms I used to stuff them were tasty, but there are so many other options, that I thought you might like this version which has a lighter tempura batter and a stuffing of local ingredients. You can even fry squash blossoms with no stuffing and no batter at all. In truth, whatever you do with the flowers, they almost always turn out delicious. One step that is often overlooked is the removal of the stamen. You can stuff the blossoms with the stamen still in, but it may make things a little bitter, and besides you want there to be as much room for the stuffing as possible. To perform that little surgical task, you can use a pair of long tweezers. I use a surgical hemostat. Scissors might work, and if your fingers are not too fat, they might work, as well. An important caution with this step is not to tear the sides of the blossom cup or the leaves. If you do that you run the risk of having all the filling run out while frying, even with a patch job. Some images on the internet show part of the flower cut away. If you are just going to stuff the flowers, that will work, but if you plan to fry them, the stuffing needs to be hidden away. Stuffed squash blossoms sound a bit complicated. They aren’t really, and they are certainly worth the effort. In a small bowl, combine the softened goat cheese and lemon juice to form a smooth paste. Stir in the shallot and parsley. In a small dry skillet over medium heat, roast the pine nuts for a few minutes, stirring them frequently, so that they brown slightly and release their oils. Be very careful not to burn. Remove from the heat. Cool. Chop coarsely if you like, and stir them into the cheese mixture. Adjust the seasoning with salt and pepper. Set aside. Prepare the blossoms by removing the stamens, being careful not to tear the petals of the flowers. If the flowers are dusty, you may rinse them, although they do best with as little handling as possible. With a spoon, pastry sleeve, or your fingers, fill each blossom with stuffing. I have found the greatest success using my fingers. Fill only to the base of the petals so that you can fold them over one another and seal them with a dab of the cheese mixture. Arrange on a plate and chill for the few minutes needed to prepare the batter and heat the cooking oil. Place one cup of flour in a pie plate. In a small bowl that is big enough to dip the blossoms individually, beat the egg yolk and ice water together and then stir in the remaining cup of flour. The batter should be smooth, but it is not essential to get out all of the lumps as long as they are not too big. Fill a deep heavy-bottomed pot with 2 inches of cooking oil and heat to 375°. It’s a good idea to use a thermometer if you have one. Temperature will plunge when you start to fry, so you will need to regulate the flame. Remove the filled squash blossoms from the refrigerator, and one at a time, dip them into the flour, shaking off any extra. Then dip them into the batter, drain for a minute, and transfer to the hot cooking oil. Working in batches of no more than three or four, fry the blossoms, turning them frequently until they are lightly browned and crisp on all sides. Drain on multiple layers of paper towel and transfer to a plate in the oven at 200° until they are all fried. Serve immediately. Three to six individual blossoms make a good appetizer-sized serving for one person. You can gild the lily, so to speak, with a dipping sauce or salsa, but the stuffed flowers can easily stand on their own.